Back in March of 2015, at Gilly’s Spring Pump Event West, I did a batch of various videos on old paintguns that people brought out. One of the more modern examples (still 15/16 years old!) that I looked over was Christian Van Horn’s single trigger Cobra LCD Angel. When I think of the radest WDP Angels I always imagine the single trigger models. 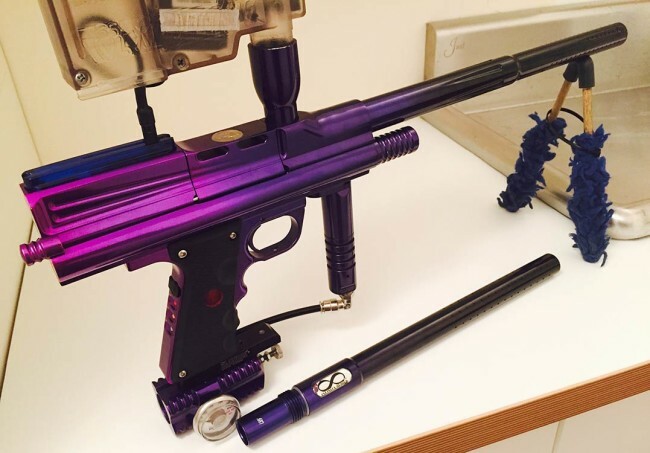 And this classic electro pneumatic paintgun of Chris’ is one of the best examples of a totally tricked out classic electro I’ve seen. Chrstian Van Horn’s Single Trigger LCD Angel with matched barrels and matched Armageddon. Photo courtesy Christian Van Horn. 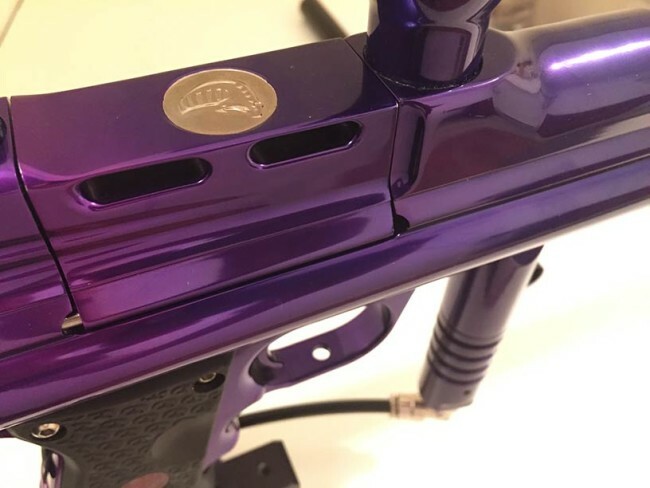 Chris purchased this Single Trigger Angel in late 2014 or early 2015 after lusting over 1996-2K Angels since their release (like the rest of us). 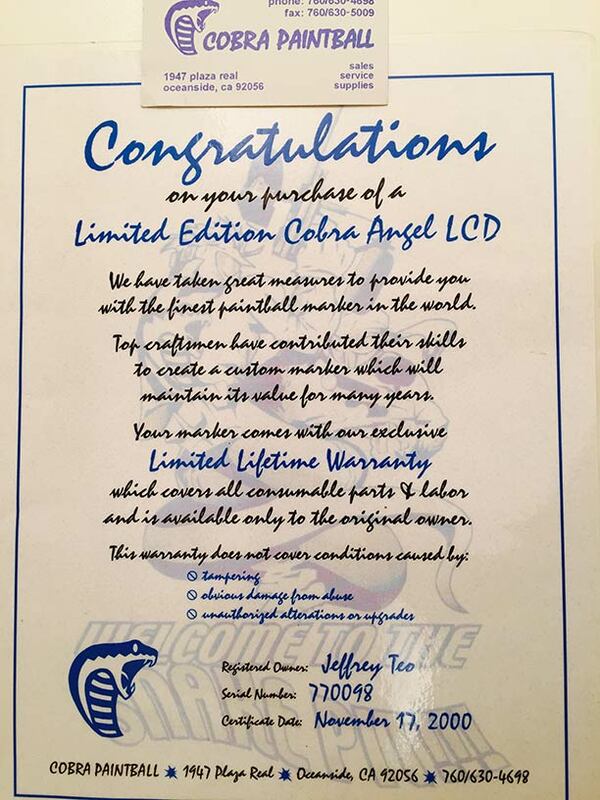 Original Owners certificate which Chris received with the LCD Angel. Photo courtesy Christian Van Horn. The original owner’s last name was Teo, and it’s printed on the owner certificate (dated November 17th, 2000) and invoice (dated Jan 2, 2001). 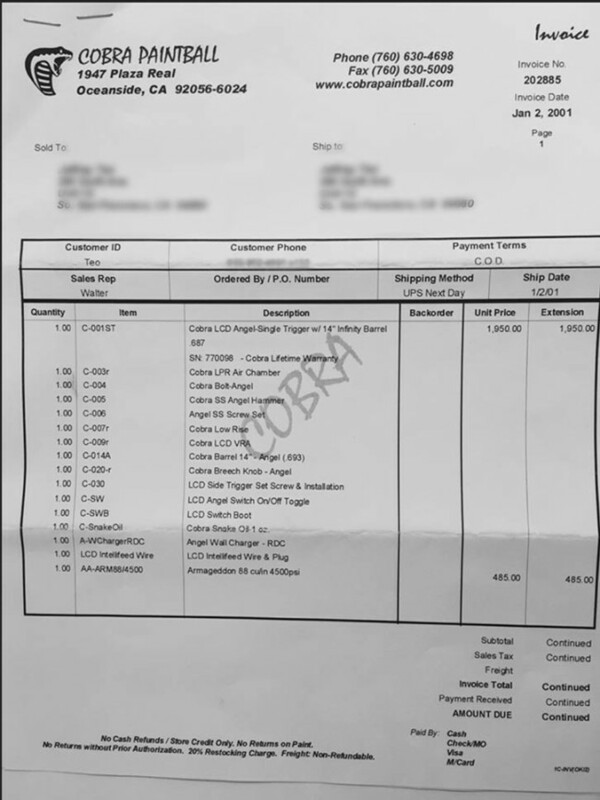 Page one of the invoice for Chris’ single trigger purple LCD Angel. Photo courtesy Christian Van Horn. 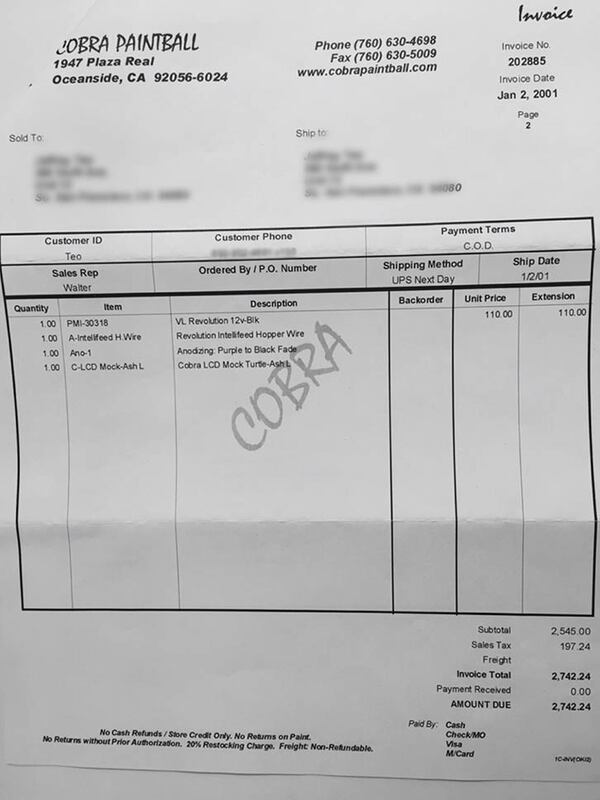 Page two of the invoice for Chris’ Cobra Angel. Photo courtesy Christian Van Horn. A look at the single trigger with Revy attachment. Photo courtesy Christian Van Horn. And it’s equipped with a match annodized Air America Armageddon in Purple! The revy is even gutted with the motor directly wired into the single trigger’s pull. As Chris explains in the video, a single trigger pull doesn’t activate the motor, but multiple pulls quickly will get the motor turning. Cobra Brass or Bronze jewel on the breech of this Angel. Photo courtesy Christian Van Horn. The top of the breech back has the gold (or brass/bronze) Cobra logo on it. 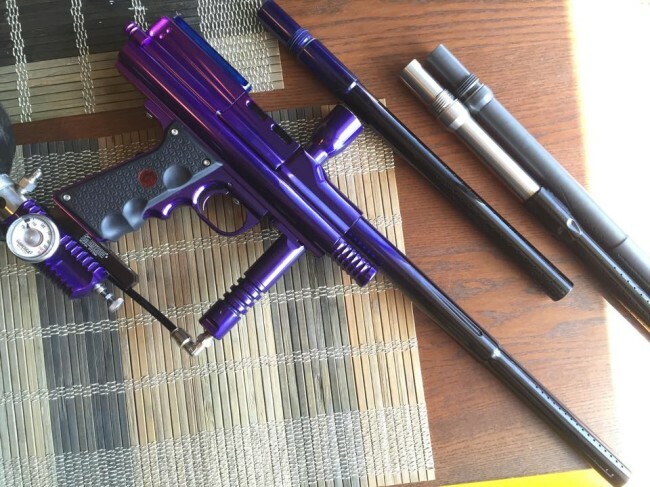 Thanks to Chris for showing this off and if you have a neat classic paintgun that you want to show me, bring it to SPEW. A look at the UK Autofeed loader shells that I just received in the mail. These shells are blue and yellow and date to the mid 1990s. Love mine. Nothing quite matches the quality of these old things, but I’m sure you know! 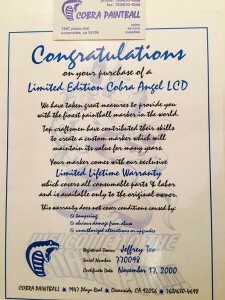 Excellent Cobra Signature Series LCD! It does in fact have a cobra vra, which is just one piece as opposed to the stock two piece vra’s. Most of the signature series’ bolts were custom fit into each gun for the best possible fit… so don’t lose that original Cobra bolt. They’re one of the best. The Cobra barrel has a “stepped bore,” which shoot surprisingly good.